As many of us wonder why we dream, there is no set answer. 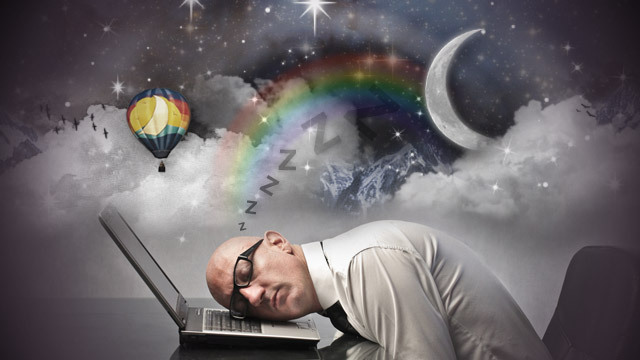 There are many theories to show why we dream, but not one theory has been proven. Today I will present you the theories of why we dream, and let you decide the reason to why we dream. One theory to why we dream is to allow our mind to sort through everything your brain collects during the periods that you are awake. As your brain moves throughout your day, it is met with thousands of minor sensory details like the color of a building. But some of these memories that occur during the day can also be very complex. Your brain can sort through important information in order to remember what is needed and to throw out what is no longer needed. This could allow us to cope with stressful events in the future. The theory is a clear representation that the brain try’s to take information that it recollects from the day to create signals which represent that information. Another theory by J. Allan Hobson and Robert McClarley states that dreams are the result of internally generated signals. This means that during sleep the brain try’s to find meaning by synthesizing and interpreting internal activity. Like the theory above, this theory also suggest that during sleep, the brain is trying to interpret many signals that came throughout the duration of the day before. Other theories has presented themselves as well, one man believed that dreams serve as a process to clean up any clutter from the mind. He related this process to the way a computer uses the clean-up operation to refresh and revive the other operations in the computer. Essentially your mind is refreshing itself to prepare for the next day to come. But with all of these reasons to why we dream, another question arises. This question is to what do these dreams represent? Have you dreamed about flying lately? This could represent how well you have control of your life. If you can effectively fly through the sky, then you are most likely confident and able to achieve goals in life. But if you are flying poorly, then you are may be frustrated with certain events that have already happened. Dreaming of death is actually not as negative as you may think. death can relate more to a dramatic change in your life. Your mind is theoretically ending one thing in order to start something new. If you have ever dreamed about being naked in public, then you are most likely feeling embarrassed and having a feeling of shame. This could relate to a particular event that may have happened or will happen in the near future. Another common dream is falling. Dreams of falling relate to feeling out of control or overwhelmed. Maybe you have a big test tomorrow and don’t know the content that will be on the test. You may have felt overwhelmed with the entire day and now that you fell asleep, you can’t stop falling to your death in your dreams. Last night, did you dream about water? If so, then the quality of the water can represent how we are managing our emotions. The water could be clear or cloudy; and calm or turbulent. The way the water looks in your dreams represents how effectively we manage emotions in our day-to-day lives. Dreaming of being pregnant represents something new. Something new could be a new job, or a new project. Dreaming of being pregnant could also represent a want to have a baby or a need to have something new come. Have you been chased in your dreams? You may be feeling anxiety if you have dreamed of being chased. Chase dreams can help us understand that we are running away from something in our lives that needs to be addressed. Maybe paying for something like the electric bill, or a overdue car payment. Lastly driving a vehicle in our dreams represents what direction we feel our life is taking. Driving a vehicle can allow us to envision ourselves getting to our goals, this also shows how much we have control over the road ahead of us and the obstacles that we may have to conquer during them.